According to Gematsu this week’s Dengeki PlayStation has some new details about Extreme Dimension Tag Blanc + Neptune VS Zombie Army. Idea Factory announced this title back at the Dengeki Bunko Spring Festival 2015. 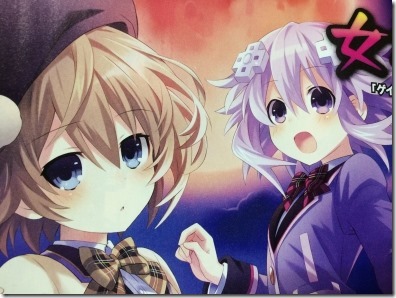 This titles seems to be an action game so it will likely be similar to Neptunia U in some ways. The story appears to take place in a school that is on the verge of being closed. Students decide to make a movie to attract people to the school, and what sells better than zombies right? Unfortunately real zombies starting showing up! So Blanc and crew can now clean up this mess in up to four player co-op action. While no release date has been announced I will be keeping a close eye on the details for this one!